First, a reminder: Tickets for our Brisbane Bicycle Film Festival are almost all sold out. We will be showing the home-grown finalists in the Brisbane Bike Bites short film festival, as well as the Australian premier of the amazing feature Why We Cycle. People are also encouraged to arrive in style, with a Style Over Speed Ride leaving from King George Square at 5:15pm. This week kicked off with an excellent presentation from Darren Davis, Transport & Landuse Integration Programme Manager for the City of Auckland. Darren gave some great advice, and we hope Brisbane can learn the lessons from Auckland, just as they have done from London, Vancouver, Calgary, and Edmonton. So far we haven’t been particularly encouraged by Brisbane City Council’s planning game but we are still urging people to jump online and provide their ideas about how transport in Brisbane will look in the future. The Victoria Bridge and proposed Neville Bonner Bridge were back in the news this week, kicked off by an article in the Brisbane Times. In Tuesday’s Public and Active Transport Meeting, Deputy Mayor Adrian Schrinner came out saying that in its current form, the Neville Bonner Bridge will not provide value to the city of Brisbane, and should be scrapped. We agree; we think its high time Council and the Queensland Government got together to come up with alternatives that will work to make our city more accessible, sustainable, and attractive. Brisbane certainly needs more green bridges, but this one has simply not been planned to connect in a functional way. Hopefully the mobility study for South Brisbane will come up with some better ideas. Belinda had a busy week, catching up with Bicycle Queensland CEO Anne Savage, and new Morningside Ward Councillor Kara Cook. On Thursday, she took a soggy ride out to the “Lord Mayor and Civic Cabinet Listens” forum at Gaythorne, and had some good discussions with various Councillors, including the Chair and Deputy for Public and Active Transport, Councillors Adrian Schrinner and Fiona King, as well as Holland Park Ward Councillor Krista Adams. 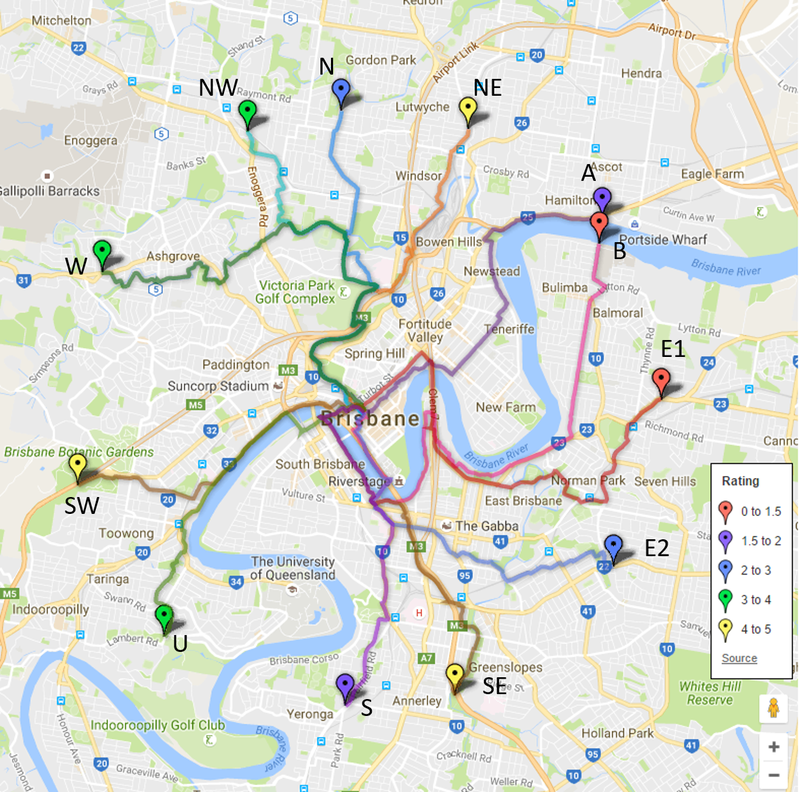 We’re keen to see a start on the North-west Commuter Route which we think could help boost cycling numbers in the north western suburbs. That discussion was timely, because Council has just undertaken to conduct alternative investigations into north-south routes that might provide an alternative to Kedron Brook Road. Unfortunately they rejected a petition from Brisbane North BUG for peak hour clearways to make Kedron Brook Road itself safer. We were challenged recently to consider the language we use on social media: are we being too critical? It’s a fair question, as we know that language matters. But at the same time, we’re trying to achieve change, and that does require challenging entrenched beliefs and “business as usual” practices. The word cloud of our posts in February so far shows the topics that have been at the centre of our conversations, and we’re actually pretty happy with our tone (but do promise to be mindful of it). On our Slow Roll this week we checked out the location for the new Botanic Gardens Riverwalk, and also took a look at the ends of Edward St and Margaret St, where we’d like to see protected bike lanes to make the city more accessible. Over the weekend, Brisbane North BUG gave us an update on progress with the cycling facilities being constructed as part of the works on Lemke, Telegraphe, and Depot Roads at Bracken Ridge / Fitzgibbon / Taigum. But our most popular post for the year so far was the Strava Art from a group of local cyclists who got creative on Sunday morning, celebrating the Lunar New Year of the Dog! Finally, it’s a long read but an excellent one: this article from New Zealand points out all the reasons it’s madness for governments not to provide facilities to enable “transportation’s silent majority” to take up travelling by bike, but also examines the reasons some people so strongly oppose it. A super great weekly update! So much information and hard work – I really appreciate all the thought, time and effort that S4CBrisbane puts into building, connecting and informing our community. Thanks and keep it up!